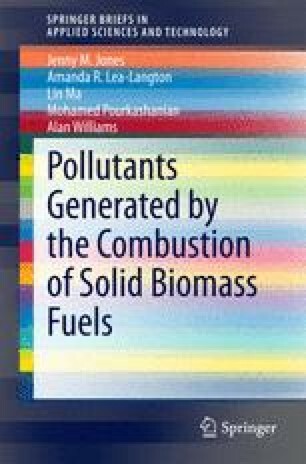 The combustion of solid biomass is covered in this chapter. This covers the general mechanism of combustion, moisture evaporation, devolatilisation, the combustion of the volatiles gases and tars and finally char combustion. Details are given about the kinetics of these reactions, the devolatilisation products which if unburned give CO and organic products and char combustion which if incompletely burned result in fine char particles in the combustion products.